A little-known Germanic Passion diptych from the late fifteenth century—comprised of the Atlanta Christ Carrying the Cross and the Chicago Crucifixion—was recently reunited, foregrounding a complex interchange of compassionate co-suffering between the two panels. The figures of Christ and the Virgin turn and twist their eyes and faces, balancing their attention between different points of empathetic contemplation within and without the frames. As they engage with the beholder and with one another, they encourage meditation on the Holy Face of Jesus by manipulating mental images in a repetitive cycle of foresight, hindsight, and exegetical reflection. In 1944, a small, Germanic panel depicting Christ’s agonizing march to Calvary entered the collection of the High Museum of Art in Atlanta (fig. 1). The scene takes place outside the crenellated walls of Jerusalem where Christ has fallen beneath his cross on the rocky Via dolorosa, the “sorrowful way” leading to the place of execution. On the left, the Virgin and Saint John lead a group of mourners from beneath the ominous, pronglike grating of the city gate. In the center, Christ turns imploringly toward the viewer, his brow streaked in blood and his eyes squinted in pain, while brightly dressed tormentors brandish a hammer and a halberd, soon to be employed in nailing their victim to the cross and piercing his side. The Atlanta painting was originally hinged in a diptych with a Crucifixion now in the Art Institute of Chicago, the two panels likely coming from the same spruce tree, with nearly identical dimensions and frames, faux marble backings, and compositions executed in the same style (fig. 2).1 In the Crucifixion, the dead Christ hangs from the cross, eyes closed and mouth ajar, while blood from his pierced feet runs down the wood and drips onto the skull of Adam. He is surrounded by witnesses, some mourning, some hostile, with the city of Jerusalem in the distance. On Christ’s right, the distraught Virgin has collapsed to the ground as Saint John gazes grimly at the gaping wound in his side. Standing just over a foot in height, the paintings were likely the focus of private household devotion. Their intimate size and emotional quality would have facilitated meditative prayer and other practices of early modern affective piety aimed at reforming the soul. In 2014, the panels were reunited for the first time and exhibited in Atlanta for a year and then in Chicago as part of the inauguration of the Art Institute’s new medieval galleries. With the diptych temporarily reunited, it is possible to observe a remarkable interaction between the suffering Christ and the co-suffering Virgin that not only plays out within the individual panels but, more importantly, extends across the frames dividing them. Far from being an arbitrary, marketplace pairing, the pendant images closely cooperate to construct a poignant devotional argument. In a circuitous cycle of anguish and empathy, the mother imitates the son, who in turn imitates the mother. They incline and gaze toward one another within and without their frames, but significantly, their apprehension of each other’s suffering is not based solely on corporeal vision. As they engage across the frame, Mary and Jesus also regard each other through their imaginations, prophetically looking ahead and mentally looking behind. Moving well beyond the formulaic and conventional, they model a dichotomy of physical and spiritual seeing that votaries meditating in front of the diptych could have imitated. The pictorial images, fastidiously rendered in paint and gold, would have prompted viewers to simultaneously consider mental images created in their hearts as they prayerfully interacted with the bleeding Christ and the Mater dolorosa. In addition to its rich collection of Polack altarpieces, the Bayerisches Nationalmuseum possesses a small-scale devotional diptych markedly similar to the Atlanta-Chicago ensemble (fig. 3). 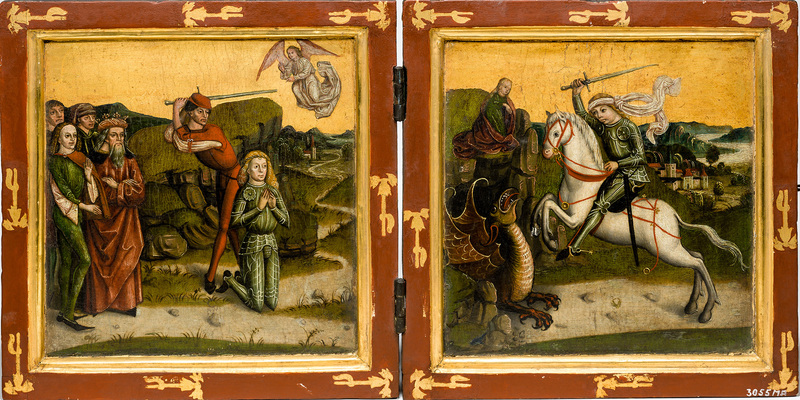 Painted around 1470 in southern Germany, it pairs Saint George’s battle against the dragon with a depiction of his martyrdom.8 Like the Atlanta and Chicago paintings, the Saint George panels feature a gold ground with engaged frames. The landscape is more generalized, and the figures betray some awkwardness in their positions and proportions, but the diptych renders metal armor, piles of heavy drapery, and highlights in a way analogous to the Atlanta Christ Carrying the Cross and the Chicago Crucifixion. Most importantly, the facial types parallel one another in their simplified features and elongated dark eyes. Although less painstaking in its details, the Saint George landscape makes use of the same kinds of castle structures and loosely painted foliage with golden highlights. Moreover, the executioner’s stance at Saint George’s martyrdom is strikingly reminiscent of the position of the halberd-bearer in the Atlanta Christ Carrying the Cross, and both figures wear nearly identical red costumes and hats. The color palettes are comparable, and both diptychs contain dusty paths dotted with similarly rendered stones. While these traits do not provide sufficient evidence to assign the works to the same creator, they point to a common artistic milieu, most likely in southern Germany. In terms of subject matter, paired Passion narratives occupy a prominent place in both the private and public art of the late Middle Ages and early modern era. The Wiener Schottenaltar, a monumental polyptych painted around 1469 for the high altar of the Benedictine Abbey of Our Lady of the Scots in Vienna, contains an extensive cycle of Christ’s suffering and death on the exterior of its shutters. When the altarpiece is closed, an image of Christ carrying the cross appears side by side with a Crucifixion scene (figs. 4 and 5). 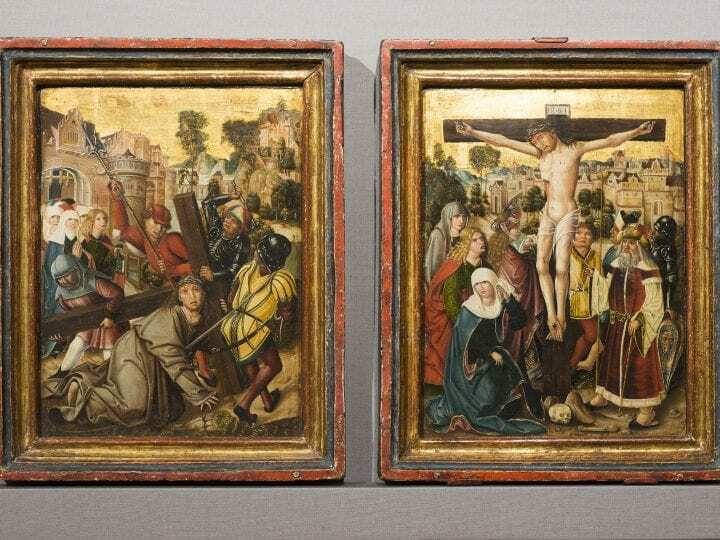 The Atlanta-Chicago diptych and these pendant scenes from the Wiener Schottenaltar are notably similar in iconography, for both adhere to venerable conventions for representing the Passion in northern European painting. 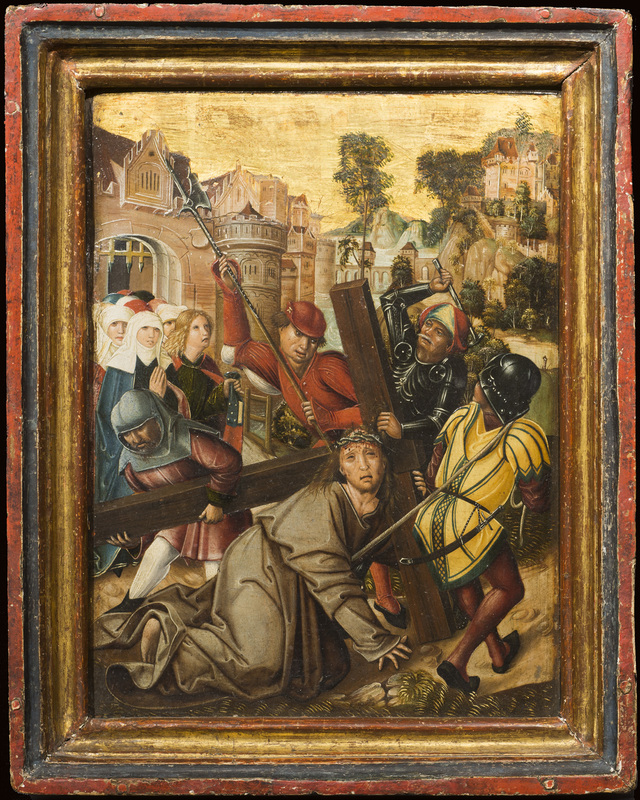 Particularly close to the composition of the Atlanta Christ Carrying the Cross is a painting by the Lower Rhenish artist, Derick Baegert of Wesel (fig. 6).9 In both works, the Virgin and Saint John huddle outside a city gate enclosing elegant towers and steeply pitched roofs, while Simon of Cyrene and the three main soldiers are positioned in much the same way. The threatening figure in red behind Christ is especially important in this regard. The placement of his hands is analogous in the two works, although in the Atlanta panel he strikes the Lord with a long halberd, while in Baegert’s image his grip on the spear morphs into a raised fist in one hand and a tightly held club in the other. 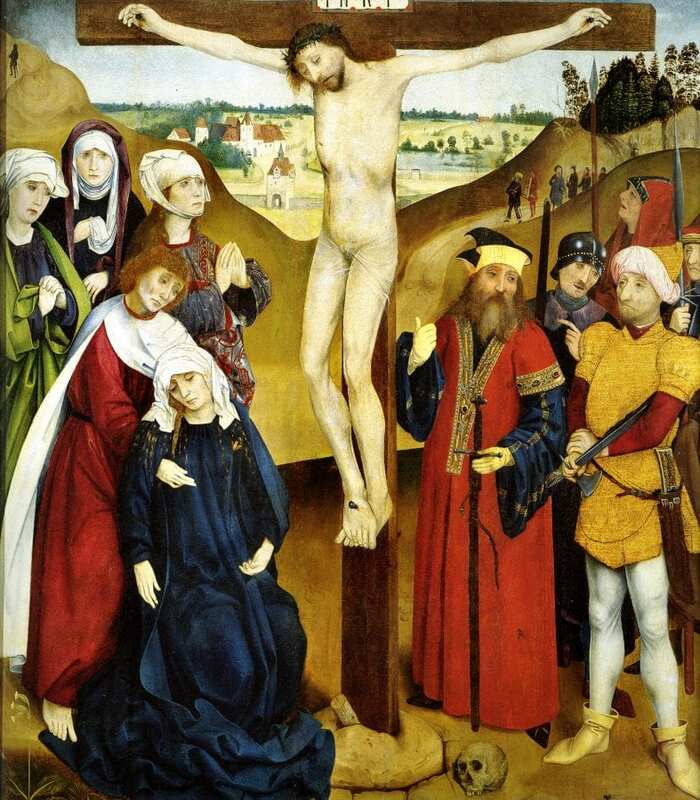 The position of Baegert’s Christ, stooped beneath the cross, conforms to the stance of Jesus in the Atlanta painting. 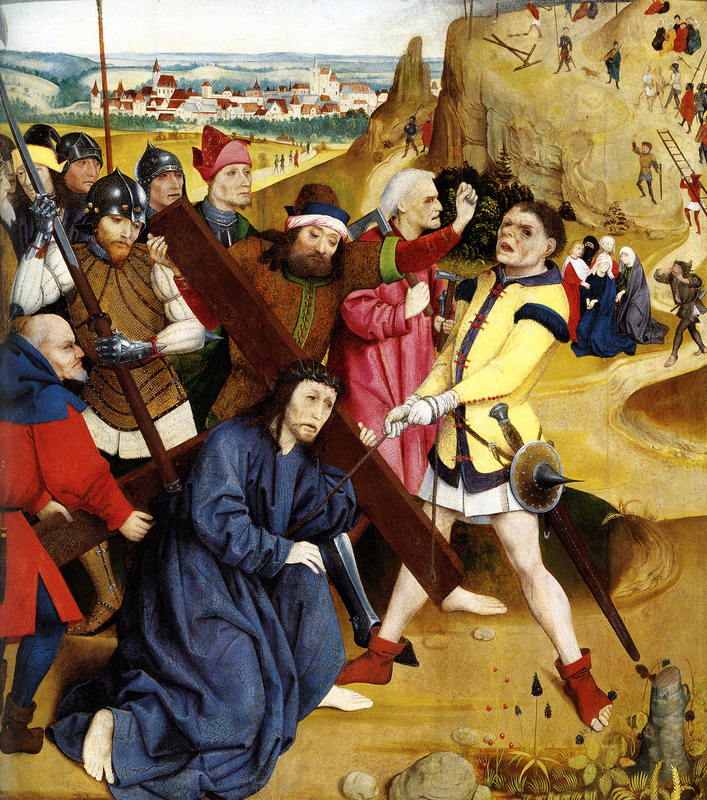 Both figures extend their right hands to offset the weight of their collapsed bodies, but while the Atlanta Christ’s hand is firmly planted on the ground, Baegert’s hovers, somewhat illogically, over the folds of his robe and the foot of one of the tormentors. Both images seem to have relied on workshop drawings, but Baegert’s floating hand indicates a more disjointed assembly of these standardized types. 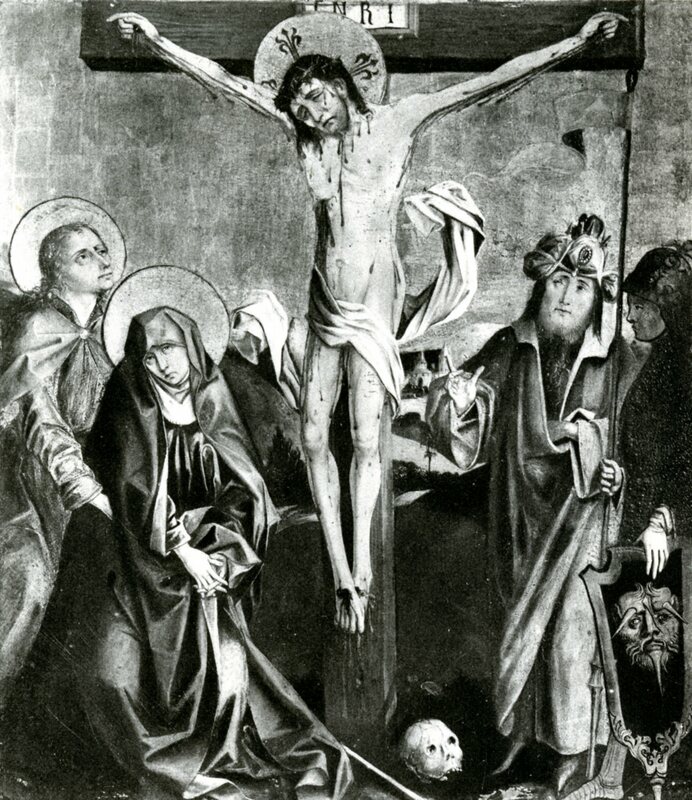 Moreover, key figures in the Chicago Crucifixion align with the composition of a Crucifixion from Freising, dated to circa 1490 and now in Munich (fig. 7).10 The crucified Christ and Saint John are distinctly similar, as are the gesturing Jewish official and the soldier holding a shield decorated with a fearsome head. Returning again to the Wiener Schottenaltar, it is noteworthy that, like the Atlanta-Chicago diptych, the juxtaposition of scenes invites the viewer to follow the winding Via dolorosa from the heated narrative of the left panel to a more static and somber moment before the crucified God in the right-hand image.11 In the Vienna paintings, the march to Golgotha climbs steeply up the rocky hillside in the right background so that the vantage point in the adjoining panel is much loftier, with a broader sweep of sky on the horizon. In the left panel of the Atlanta-Chicago diptych, the forward movement of the soldier in the yellow doublet propels the viewer’s eye along the rocky road before twisting the gaze back along the face of the mountain to reach the aqueduct in the distance. The Crucifixion, hinged on the right as the end point of the meditative journey, also stands on elevated ground, with the cityscape distant and diminished in size. Naturally, the sudarium has special relevance to representations of Christ carrying the cross. 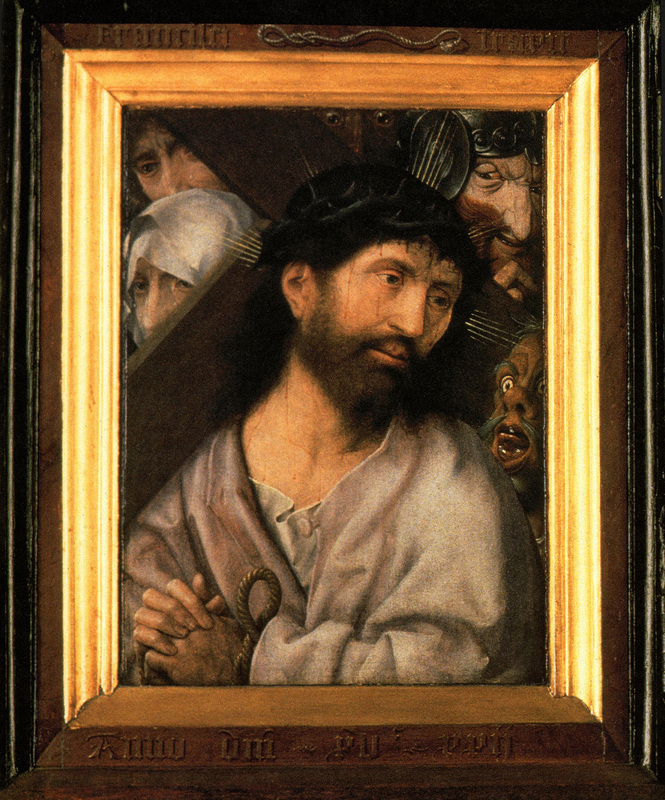 Many of these images contain a flurry of narrative detail, in contrast to Bouts’s telescoped diptych, and yet they often belie the potential to be “frozen” and distilled by the votary into a personalized encounter with the Holy Face.23 Sometimes Saint Veronica appears in the jostle of mourners and mockers crowded around Christ, the face on her sudarium bearing an express likeness to the face of its prototype beside her. 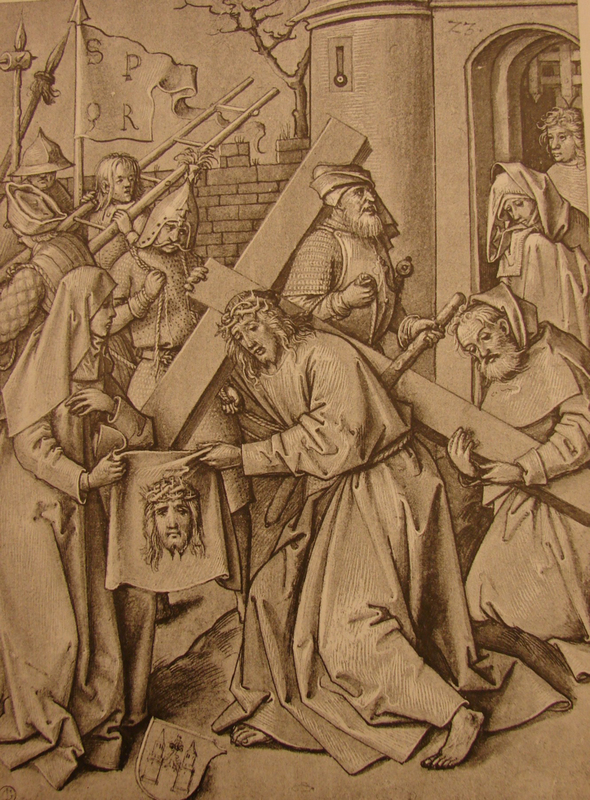 At times, the acheiropoietic head (“made without hands”) exhibits a tactile, three-dimensional quality, as in an engraving by Martin Schongauer, in which the Holy Face floats above the folds of the cloth and stares at the viewer with an intensity and directness that takes preeminence over the gaze of the living Christ (fig. 9). 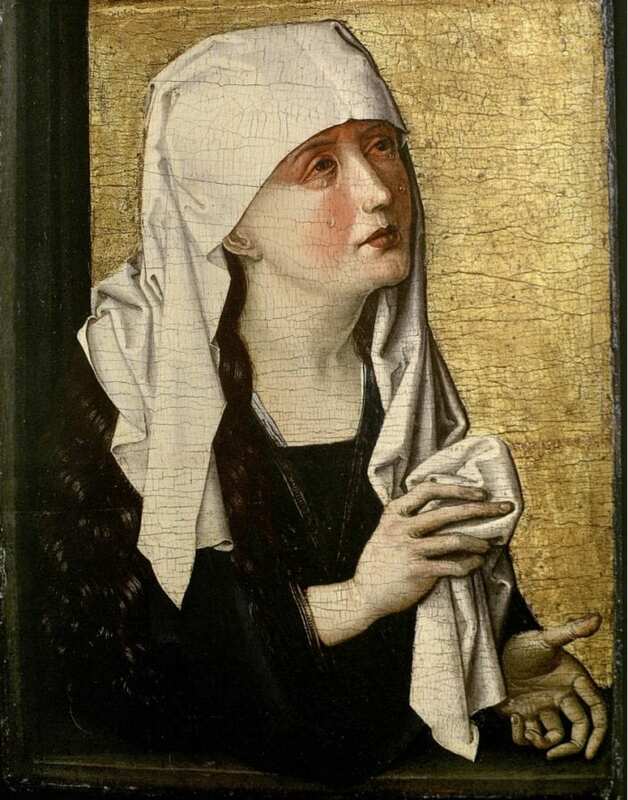 In other instances, Saint Veronica offers the Lord a blank towel, encouraging the viewer to imaginatively complete the miracle that transferred Christ’s features to the cloth. In the Atlanta painting, Simon of Cyrene demonstrates similar empathy. 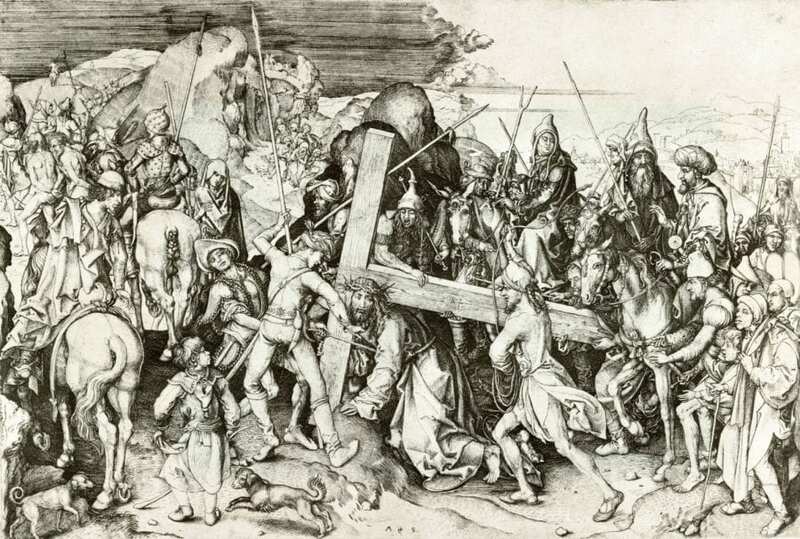 At the other end of the spectrum from the jeering soldiers—and literally standing at the other end of the cross—he willingly hefts Christ’s burden, modeling devout imitation by “tak[ing] up his cross, and follow[ing]” the Lord.35 An informative drawing of Christ carrying the cross by Hans Holbein the Elder connects the Christological imitation of Simon of Cyrene with the perfect likeness of the Lord imprinted on Saint Veronica’s towel (fig. 12).36 In the image, Simon lifts the end of the cross, precisely as he does in the Atlanta panel, but here he also leans forward and bows his head to physically conform to the pained posture of Christ’s body. That Simon has been “imprinted” with the Lord’s likeness is made self-evident by Saint Veronica, who complements and explicates his piety as she and Christ together hold the sudarium. Itself an “imitation” and simulacrum of Jesus, her precious towel becomes an ensign for Christ’s heavenly kingdom, calling the humble to take up their crosses like Simon, in contrast to the Roman standard directly above, which musters the ranks of a worldly empire with an abbreviation of Senatus popolusque romanus. The Virgin Mary is the preeminent imitator of Christ, and in the Atlanta-Chicago diptych the conformities between mother and son cycle within and between the two panels in complex exempla of devotional empathy. In the Chicago Crucifixion, the Virgin has fallen to her knees, her soul pierced with compassion for the dead Jesus, her own deathlike collapse broken by the supporting arms of Saint John. It is critical to note that her crumpled position on the ground resembles the stance of Christ, sprawled in the dust of the Via dolorosa in the Atlanta Christ Carrying the Cross. That the Mother of God more blatantly imitates the Atlanta Christ than she does the crucified Jesus beside her is bolstered by an intriguing departure from the underdrawing of the Chicago panel (fig. 13). The Virgin’s right hand was initially intended to be turned upward so that it resembled the pierced hands of Christ on the cross, as if she had suffered a sympathetic wound in her palm. In the finished panel, however, the artist turned the Virgin’s hand downward, causing it to conform to the right hand of Christ in the Atlanta painting. The Chicago Virgin’s raised left hand also mirrors the left hand of her son as he holds onto the cross. The Chicago panel thus embeds Mary’s memory of Jesus’s fall into her swoon on Calvary. This compelling compositional idea is not unique to the diptych, however. Indeed, the corresponding scenes from the Wiener Schottenaltar achieve a similar effect (see figs. 4 and 5). Crushed by the weight of his cross, the Vienna Christ looks purposefully toward his unconscious mother in the adjoining panel. As Simon of Cyrene helps heft the burdensome cross, so Saint John sustains the Virgin’s dead weight, a trope that is repeated in the Atlanta and Chicago panels. And all these things are said and done in the presence of his most sorrowful mother, whose own suffering greatly increased her son’s suffering, as his did hers. Virtually she was hanging on the cross with her son; and she would have chosen rather to die with him than live on. the suffering of her beloved son. She suffered with him, he suffered with her. mourn, good sisters . . .
Not surprisingly, the reciprocal anguish of the Marienklagen derives from the same affective tradition of Franciscan spirituality that produced the Meditationes.46 The staging of the Passion in the Atlanta and Chicago panels operates similarly to these texts, with the cycles of empathy between Christ and Mary playing out like a painted Marienklage. The diptych’s circles of compassionate sight and memory ultimately depend on and give rise to a stirring iteration of Holy Face devotion. Saint Veronica and her sudarium appear consistently in German Passion plays, in which the miraculous image of Christ’s countenance is likened to a salve for the sorrowing spirit, a salvific sign, and the fulfillment of the saint’s wish to have the Lord’s “great torture” “plant[ed] in [her] heart.”47 In the Meditationes, spoken words fail the Virgin and her son at their meeting “outside the city gate,” and it is “face-to-face” gazing that constitutes their only communication. Unlike most images of the sudarium or Schongauer’s cultic presentation of Christ’s head, the Holy Face of Jesus in the Atlanta panel is not completely frontal, nor does Christ make direct, piercing eye contact with the votary. Rather, the Lord’s attention slips back and forth between three points. On the one hand, he emphatically faces viewers meditating before the diptych, his squinted eyes and open mouth appealing to their mercy. At the same time, he tilts his head back slightly, as if acknowledging his mother behind him and responding to her silent prayer with a prayer of his own. 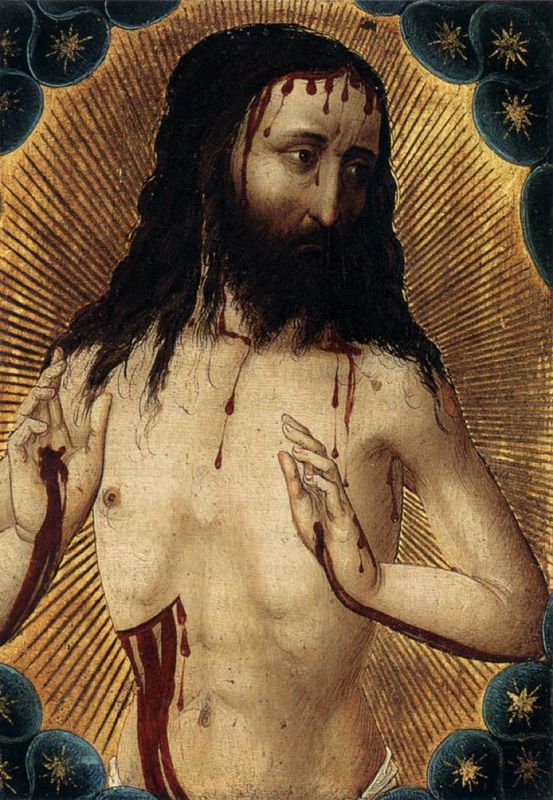 Most importantly, though, his face turns marginally to the right, and his pupils veer beyond the painting’s frame toward the Virgin in the Crucifixion panel. For her part, the Chicago Virgo doloris turns blatantly to the left, appearing to meet the gaze of her son looking up from the dusty road in the Atlanta image. Close inspection of Mary’s face, however, reveals that she stops short of fixing her eyes on the fallen Christ. Instead, her gaze shifts back to the right, toward the dead Jesus suspended from the cross. In this way, the communion of Christ and his mother vacillates between different registers of perception. The slight inclination of Christ’s head in the Atlanta panel responds in historical time to the fixed gaze of the Virgin standing behind him. Since her “suffering greatly increased her son’s suffering, as his did hers,” Christ’s apprehension of his grieving mother becomes a catalyst for prophetic foresight as he looks ahead to behold the culmination of Mary’s sorrows in the adjoining panel when she collapses with exhaustion on Calvary. The painting thus construes Christ’s own collapse beneath the cross as an empathetic anticipation of the Virgin’s swoon. With the position of his head and eyes delicately balanced between present and future manifestations of his mother’s pain, Jesus configures his own suffering as a filial act of imitatio Mariae, as Passion becomes Compassion. The Chicago panel situates the kneeling Virgin between two similar poles of perception. Although she turns her eyes to the dead Christ beside her, her vision is partially obscured by the white veil draped over her uplifted hand. The forcible twist of Mary’s head in the opposite direction of her eyes only underscores the visceral reaction of a stricken mother who cannot bear to see her son’s broken body and yet also cannot bear not to look at him. As in the Marienklagen, relatable, maternal pain leads to conformitas, as the Virgin’s suppression of corporeal vision gives precedence to a different mode of perception: her memory of Christ on the path to Golgotha, articulated in the eyes of her mind as clearly as it is rendered in paint on the facing panel. It is significant, in this regard, that in the Atlanta painting, Christ’s recognition of his mother standing behind him is also obscured, unseen, and only acknowledged by a subtle tilt of his head. The riveting revelation that transforms his body into the likeness of the Virgin’s future suffering is transmitted through the noncorporeal register of prophecy and foresight. In the Chicago panel, it is hindsight, rather than foresight, that draws the Virgin’s attention away from the somber aftermath of the Crucifixion and back to a vivid memory of the Via dolorosa. Having now witnessed the entirety of her son’s Passion, it is fitting that Mary “looks back” on the Atlanta panel from a higher vantage point, literally positioned on the elevated hill of Golgotha with the cityscape in the distance behind her. The panoramic spectacle from this lofty lookout analogizes the razor-sharp register of sight in the Virgin’s memory. As if unwilling to cease rehearsing the suffering of her son, the swooning dénouement of Mary’s Compassion recapitulates the pitiable fall at the commencement of his path to execution. These circles of foresight, hindsight, and external and internal vision intersect constantly. The diptych presents the cycle of empathetic perception through the configuration of mother and son, who not only adopt similar postures but also turn and tilt their heads and eyes, as if pulled backwards and forwards by the circular trajectory of their Passion and Compassion. This pictorial strategy, which ultimately inscribes memory and spiritual apprehension in the “empty space” between the two panels as the rationale “hinging” the scenes together, is one of the most compelling aspects of the diptych. It bears witness to a finesse of devotional argument, too easily obscured by deceptively routine iconography. In fact, a similar logic “hinges” together the Saint George paintings, discussed previously (see fig. 3). As the executioner swings his sword toward St. George’s neck, the kneeling martyr gazes calmly toward the other half of the diptych, remembering the blade he wielded against the demonic dragon and contrasting it with the death blow that will shortly admit his soul into paradise. When the Atlanta and Chicago panels were propped open at an angle, Christ and the Virgin would have faced each other from across the frames. This “sight line,” which contradicts the constraints of time and place, is common in northern devotional art from the fifteenth and sixteenth centuries. The Bouts Ecce Homo and Mater Dolorosa, cited earlier, provide a good example, with mother and son pivoting toward one another yet not communicating by corporeal sight. The Lord’s blood-shot eyes stare thoughtfully into space, while his mother’s gaze—already blurred with profuse tears—is lowered. In short, their meditative vision of one another is internal, imaged in the heart rather than in the eye. 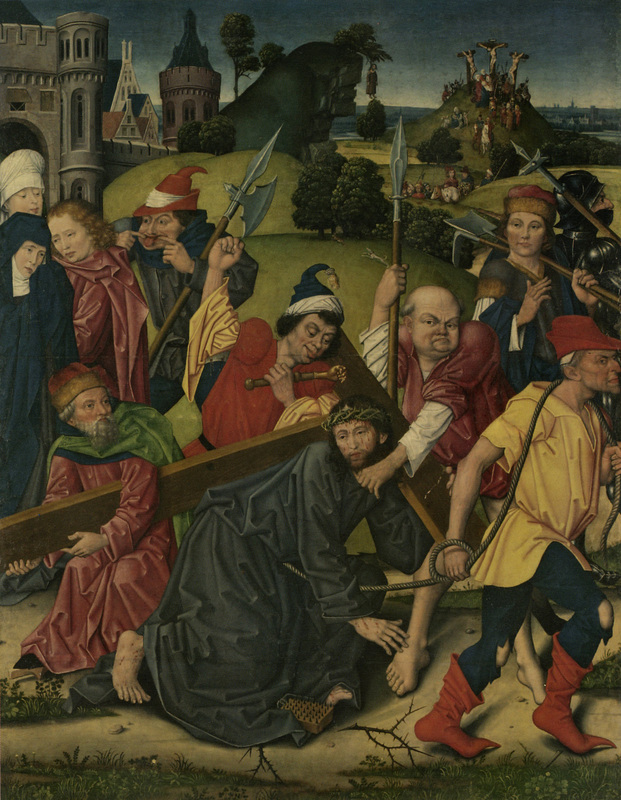 A related scenario occurs in Jan Provoost’s diptych of Christ Carrying the Cross from 1522 (fig. 14). The Franciscan patron in the left panel looks straight ahead, with the intent, albeit unfocused, gaze typical of visionary sight in Netherlandish painting.48 Christ, by contrast, looks purposefully at the votary portrait, his eyes angled downward, as if peering into the friar’s heart. That this diptych most fundamentally engages internal vision—“heart-to-heart” seeing—is made explicit by the two miniature hearts depicted along the upper edge of the donor panel. Together with a representation of a Franciscan cord on the top of the Christ panel, the hearts function as pictographs, accompanying painted words in an inscription reading, “Franciscan cords carry [or draw] the most hearts” (Francisci chorda traxit ad se plurima corda).49 Making a clever word play on the Latin chorda/corda,50 the painting implies an analogy between the knotted cord that recalls the Franciscan vows and the spiritual cord that binds the heart of Jesus to the heart of the friar. That emblematic rope is as steadfast as the lash that ties Christ’s hands and as unwavering as the intense gazes of the two figures. Although the Atlanta-Chicago diptych exhibits similar internal seeing, it differs from the Pleydenwurff, Provoost, and Bouts panels in that it puts two narrative compositions in conversation with one another rather than two half-length, close-up figures already excised from the distractions of plot and setting. As a result, the introspective, “heart-to-heart” exchange between Christ and Mary across the frames is, at first, less apparent. Opening the diptych at an angle discloses the unexpected engagement between the Atlanta Christ and the Chicago Virgin and invites the viewer to use their interaction as a guide for pondering the images. In other words, votaries are to employ the same cycles of foresight, hindsight, memory, and emotional empathy used by Jesus and Mary as tools for discerning exegetical and devotional meaning in the Passion narrative. The diptych provides specific examples of these cognitive processes. For instance, Christ interprets his own suffering typologically as he uses his fall to picture Mary’s collapse and his own expiration on Calvary. Suspended from the rood in the Chicago painting, the dead Jesus faces back toward the Atlanta panel, as if he had been recalling that dusty fall at the moment of its antitypical fulfillment, when he “gave up the ghost.”52 The Chicago Virgin’s memory of her son, huddled in the dirt like “a worm and no man,” layers an exegetical reading of the Psalms onto her eyewitness of his ignominious death. This memory—visualized by the Atlanta painting—also contains a recollection of herself prayerfully watching Christ along the Via dolorosa. The exacting nature of her observation is apparent by her fixed gaze, stoic face, and neatly positioned hands. Such rigorous, self-conscious gazing is afforded a special place in the Chicago Virgin’s memory because the images she sees become raw material for her to ponder, manipulate, and reassemble as she refashions herself in emulation of Christ. Her swoon beneath the cross, then, is not only a culminating expression of emotion but also an indicator of incisive cognitive exercise as she conforms her body to the mental image of her collapsed son. In like manner, the diptych calls on viewers to look intently and self-consciously at the pendant images with heightened awareness that their methodical gazing could secure a devotional experience which circles back and forth in time and space, marshaling memory, exegetical interpretation, and imagination to achieve empathetic, “heart-to-heart” communion with the Lord and his sorrowful mother. Indeed, the votary’s multipart endeavor of looking ahead and behind, ascertaining type and antitype, and plumbing the affective depths of memory is itself an imitation of Christ and the Virgin. Having fallen to the ground in the depths of abject emotion, mother and son twist their minds forward and backward in conjunction with the shifting positions of their eyes, faces, and bodies. They join the viewer in looking up and ahead from the dirt of the Via dolorosa and down from Mount Calvary with panoramic hindsight. A comparable exchange of typology and exegesis plays out between the narrative panels of another German Passion diptych (fig. 17). Dating to circa 1410 and conserved in the Bayerisches Nationalmuseum, the paintings depict a scene of Christ’s agony in the garden on the left and a Crucifixion on the right.53 Drops of blood streak the white garments of Christ as he kneels before a chalice, pleading with the Father to “let this cup pass.”54 Saints Peter, James, and John slumber beside him, despite the Lord’s exhortation to “watch and pray.”55 The left panel instigates the Passion, and the right panel concludes it, as the ominous cup of Gethsemane becomes two Eucharistic chalices held by angels attending at the cross. The Crucifixion, however, functions equally well as a rendering of Christ’s foresight, pictured in his mind’s eye as he meditates in the garden. As the Lord “in an agony . . . pray[s] more earnestly,” the triumph of his Passion takes shape in the adjoining panel, like a prophetic vision.56 He anticipates the completion of his suffering, when he would “bo[w] his head” and claim the relief of deathly sleep, analogous to the slumber of his three fatigued apostles.57 Conversely, the exhaustion of Saint John in the left panel—where he “sleep[s] for sorrow”—anticipates his acute and restless grief in the right-hand painting.58 There, he and Christ exchange roles as the evangelist atones for his careless dozing in Gethsemane by throwing back his hands and face to rivet his wakeful attention on the now-unconscious Jesus. Significantly, the stance of the swooning Virgin on Golgotha echoes the positions of the sleeping disciples in the left panel in order to contrast her Compassion with their sloth. In the Atlanta-Chicago diptych, Mary’s manipulation of mental images inspires specific devotion to the face of Christ. As noted earlier, the Chicago Virgin turns away from the cross and lifts a segment of her veil with her left hand, perhaps to block the specter of her son’s corpse or to blot her eyes. The gesture draws attention to her face and, by extension, to the Holy Face of Jesus across from her, awash with tears and tactile streaks of blood. Raising the cloth to her cheek, Mary makes a sympathetic gesture to wipe the wounded head of her son, deeply emblazoned in her mind’s eye. The anguish of her memory has not only inspired her to emulate the compassionate ministration of Saint Veronica but to absorb the visage of Christ into her own countenance. Her pale face and the stark white of her immaculate veil contrast with the flushed and bloodied head of Christ, and yet the tears that brim from her watery blue eyes and collect in pools of bright highlights on her cheeks are consonant with the dripping face of her son. Significantly, tears no longer flow from the eyes of the crucified Christ, making the Virgin’s imitative weeping a function of her memory of the Via dolorosa, rather than of the present moment on Calvary. So pristine is the white fabric enveloping her fair skin that it prompts a phantom presence of bloody stains, implicit through the intensity of her empathy.59 This is especially so, given the red clothing worn by the figures on either side of Mary, which makes a dichotomous backdrop to her veil. Images of the Mater dolorosa and other mourners with heads and hands veiled in white occur elsewhere in German art. 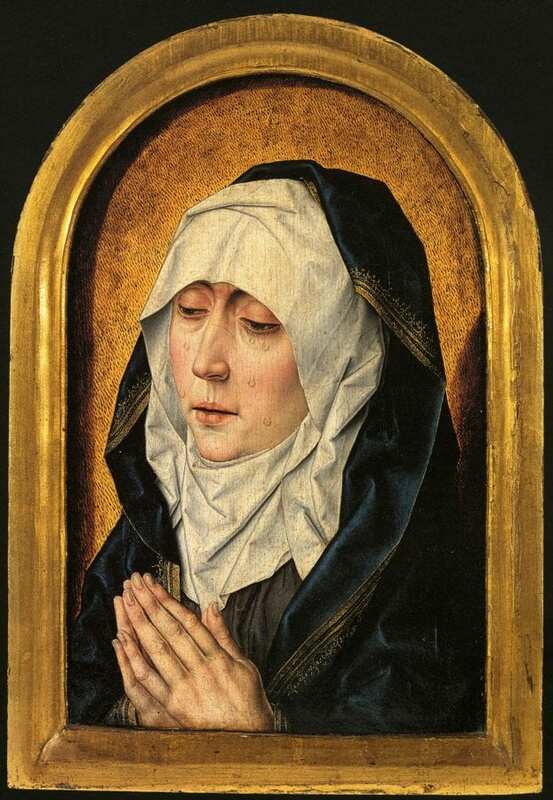 The Mother of Sorrows from the Cummer Museum of Art, attributed to the Nuremberg-based Master of the Stötteritz Altarpeice and dated circa 1470, depicts a similarly dressed Virgin, the white material held in her hands and draped over her brow jarring dramatically with her bloodshot eyes and swollen face (fig. 18). As in the Chicago Crucifixion, it is not difficult to project blotches of red onto the white cloth. In fact, there is a well-known tradition of portraying the Virgin’s veil dotted with Christ’s blood, and in Germanic Pietà scenes Mary sometimes uses her mantle to dab at the wounds on her son’s broken body.60 In the Cummer Mother of Sorrows the Virgin’s tears, tinted pink from her reddened face, seem just as likely to stain her pure veil. David Areford further notes that the convention of cloth held in or wrapped around the Virgin’s hand implies a touching gesture and speaks to the Germanic fascination with Marian cloth relics during the fifteenth century.61 This association only bolsters the Chicago panel’s allusion to the most precious cloth relic in Christendom, as the Virgin’s imagination transforms the veil covering her head into the sudarium that wiped the Holy Face of her son. This two-part, meditative endeavor in reaching out to the Lord’s wounded countenance and then taking a simulacrum of that countenance back in return is an extrapolation from the sequence of gestures made by these cloth-bearing women. The Magdalen extends her handkerchief away from her weeping eyes and toward the river of Christ’s blood. The Virgin, on the other hand, lifts her veil to her eyes, as if transferring the vera icona to her own face, as she relives her memory of the fallen Christ. Her movement reiterates the reality made explicit by the diptych’s circular interchanges of turning and gazing: that Christ’s image is already indelibly etched in the mind of his mother, as her image is in his. Ultimately, the Atlanta and Chicago panels construe Holy Face devotion as an encounter in several different media: running with blood and tears, printed on the towel of Saint Veronica, reconfigured in the imagination, and rendered in pigments and gold on spruce planks covered in canvas and chalk ground. There exists yet another object in the diptych that, through its position, form, and medium, prompts meditation on the sudarium, albeit by counterfeit. On the right edge of the Chicago panel an armor-clad centurion stands among the group of officials endorsing Christ’s execution. His profile stance mimics the position of the Magdalen, but his helmet is pulled down over his eyes, and rather than holding a handkerchief, he balances a fanciful kite shield, probably made from brass and steel, and bearing a large, solar face.63 Such shields appear regularly in Passion scenes, their grimacing expressions parroting the cruelty of the soldiers and the barbarism of paganism. Within the devotional interchange of the Atlanta-Chicago diptych, however, this shield acquires a unique function. The disembodied head, with a ring in its mouth and surrounded by a mane of pointed, metal rays, evokes images of Christ, crowned with thorns and floating mystically above the folds of cloth on Saint Veronica’s veil. Although not shackled with a ring through his lip, the Atlanta Christ is led to his death by a rope, and the sharp tip at the bottom of the shield is reminiscent of the halberd prodding him along the road and the nails that would be driven through his hands and feet. The centurion’s grip on the shield even approximates the hand of the tormentor dragging Christ by the hair in the opposing panel, and they wear the same dark armor.64 Were it not for the gray mustache of the Atlanta figure, they could be mistaken for the same man, the Chicago soldier having traded back his fabric hat for his rightful helmet. Likely alluding to a Roman deity, the molten effigy on the shield counterfeits the Christian God, whose cross and blood-stained body were envisioned as a protective shield in late medieval literature.65 Unlike the sudarium, the pagan shield is the product of human artifice, its metal contours as hard and unresponsive as the features of an idol. On the other hand, the constitution of the Holy Face is delicate and supple—the cloth, flesh, sweat, blood, wood, and paint bodying forth the incarnate God who substituted “fleshy tables of the heart” for the Mosaic tablets of stone.66 Given the fundamental role of spiritual and corporeal sight in apprehending the Holy Face, it is significant that the soldier holding the shield is blinded by the impenetrable visor of his helmet.67 The eyes of the solar head are themselves turned emphatically to the right, as if straining not to see the true “shield” for all Christians, hanging from the cross. Like an echo of the heathen idols that plummeted from their altars at the flight of the Holy Family into Egypt, the head anticipates the fall of paganism as another antitype of Christ’s fall on the Via dolorosa. Its refusal to look is made particularly blatant by the Jewish elder just to the left who points to Christ. As the antithesis of the weeping Virgin, the impassive face pivots away from the hinged threshold between the two panels, across which the diptych’s interchange of empathy, memory, and prophecy occurs. It is that liminal border between the Atlanta and Chicago paintings where viewers could join Christ and the Virgin in their circular exchange of compassion. The diptych calls for attentive looking, whether set up on a table or held close to the face, like an open book. The meditative images votaries would transfer from the canvas-covered panels to the “fabric” of their minds would constitute a kind of internal sudarium. Like their historical prototype, these memories would take shape “without hands,” from the tears and sweat of personal compunction, propelled by the violence of the Atlanta panel’s tormentors and the sharpness of the Lord’s thorny crown. Having printed his countenance in their minds, viewers could then look away from the diptych like the Chicago Virgin, who shields her eyes from her crucified son, and yet never lose eye contact with the anguished face of Christ staring out of their hearts. Elliott D. Wise is Assistant Professor of Art History at Brigham Young University. His research focuses on the function of art in late medieval and early modern devotion, with special interest in Eucharistic, liturgical, and Marian imagery. His essays on Rogier van der Weyden and vernacular mysticism appear in Imago Exegetica: Visual Images as Exegetical Instruments, 1400–1700 (Brill, 2014) and Rethinking the Dialogue Between the Visual and the Textual (Brill, forthcoming 2018). The research for this essay was made possible by the Andrew W. Mellon Fellowship for Object-Centered Curatorial Research, administered jointly by the High Museum of Art and Emory University. I express appreciation to Walter S. Melion and Elizabeth Carson Pastan of Emory University; David Brenneman, former chief curator at the High Museum, and the museum’s invaluable staff: Elizabeth Riccardi, Alexandra Skliris, and Virginia Sweeney; Larry Shutts of the Atlanta Art Conservation Center; Renée Stein, conservator of Emory’s Michael C. Carlos Museum of Art; and Martha Wolff, curator at the Art Institute of Chicago, along with the Art Institute’s conservation staff, especially Daniela Leonard. I would also like to thank Veronica Pirker-Aurenhammer of the Belvedere Museum, Guido Messling of the Kunsthistorisches Museum, and Daniel Hess of the Germanisches Nationalmuseum for consulation and access to their collections during my visits to Vienna and Nuremberg. I am grateful to the two anonymous reviewers of this essay, whose comments and suggestions strengthened my arguments and led me to consider late medieval mystery plays. Finally, I particularly thank Walter S. Melion, who first directed me to the mutual compassion and reciprocal gazing between the figure of Christ in the Atlanta panel and the figure of the mourning Virgin in the Chicago painting. 1. The Crucifixion entered the collection of the Art Institute of Chicago in 1947. Technical investigation of the frame revealed evidence that hinges and a clasp were formerly attached. Richard R. Brettell and Steven Starling, The Art of the Edge: European Frames 1300–1900 (Chicago: Art Institute of Chicago, 1986), 80, cat. 33; Martha Wolff, Susan Frances Jones, Richard G. Mann, and Judith Berg Sobré, eds., Northern European and Spanish Paintings before 1600 in the Art Institute of Chicago: A Catalogue of the Collection (New Haven: Yale University Press, 2008), 327. The suggestion that the panels came from the same tree is based on the results of technical analysis, communicated to me during a meeting at the Art Institute on August 18, 2014. 2. On August 15, 2013, I attended an examination of the Atlanta Christ Carrying the Cross under the direction of Larry Shutts, Renée Stein, and other conservators based in Atlanta. We observed that the paint from the surface is not continuous onto the current frame. In fact, an earlier frame could have once been in place, now only attested to by a ridge at the top of the panel. Until recently, the Art Institute of Chicago posited that the Crucifixion was still in its original engaged frame. Brettell and Starling, The Art of the Edge, 80; Wolff et al., Northern European and Spanish Paintings before 1600, 327. 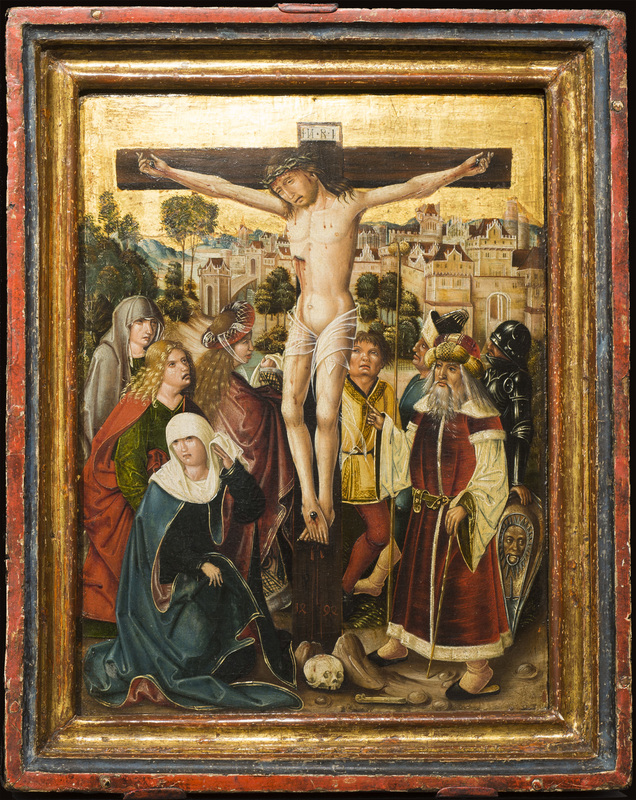 Technical investigation from 2014, however, indicates that, like the High panel, the Crucifixion was not painted in the frame it currently occupies. There are modern nails attaching both panels to their frames, but the Chicago conservators assume these were added for reinforcement. 3. Charles L. Kuhn, A Catalogue of German Paintings of the Middle Ages and Renaissance in American Collections (Cambridge, Mass. : Harvard University Press, 1936), 74, cat. 322. 4. Wolff et al., Northern European and Spanish Paintings before 1600, 327–29, esp. 328. 5. See ibid., 328; Daniel Catton Rich, ed., Catalogue of the Charles H. and Mary F. S. Worcester Collection of Paintings, Sculpture and Drawings (Chicago: Art Institute of Chicago, 1938), 36-37; Kuhn, A Catalogue of German Paintings, 74, cat. 321 and 322. From the High Museum curatorial file, see correspondence from E. R. Hunter, director of the High, to Hanns Swarzenski of the Warburg Institute, March 26, 1951; correspondence from Hanns Swarzenski to E. R. Hunter, 1951, which claims that the High panel is “certainly Austrian”; correspondence from Ilse Hecht of the Art Institute of Chicago to Eric Zafran of the High Museum with attachment of a catalogue entry for the Crucifixion, March 23, 1982. From the Chicago curatorial file, see correspondence from Wilhem Suida, July 14, 1934; correspondence from Daniel Catton Rich of the Art Institute, June 13, 1944; notes from Franz Winzinger’s visit to the Art Institute, December 18, 1968; notes from Ilene Warskowsky, September 1976. It is worth noting that the Atlanta-Chicago diptych also bears some stylistic similarity to the work of the Salzburg Master of Laufen (active 1435–1465). See Salzburger Museum Carolino Augusteum, Spätgotik in Salzburg: Die Malerei 1400–1530 (Salzburg: Salzburger Museum Carolino Augusteum, 1972), 64–69; Ludwig Baldass, Österreichische Tafelmalerei der Spätgotik 1400–1525 (Vienna: Kunsthistorisches Museum, 1934), 25–26, 46, cat. 28. 6. See Wolff et al., Northern European and Spanish Paintings before 1600, 328–29. 8. See Karl Voll, Heinz Braune, and Hans Buchheit, Katalog der Gemälde des Bayerischen Nationalmuseums (Munich: Bayerisches Nationalmusem, 1908), 246, cat. 882. 9. See Jürgen Becks and Martin Wilhelm Roelen, eds., Derick Baegert und sein Werk (Wesel: Stadt Wesel, 2011). 10. Fritz Koreny, of the University of Vienna, suggested this comparison to the Chicago Crucifixion in correspondence to Martha Wolff, October 11, 2005, available in the Art Institute’s curatorial file. See Alfred Stange, Deutsche Malerei der Gotik, vol. 10, Salzburg, Bayern, und Tirol in der Zeit von 1400 bis 1500 (Munich: Deutscher Kunstverlag, 1960), 118, cat. 189. For another similar pairing of Christ Carrying the Cross and the Crucifixion, see two panels from a retable by the Master of the Salem Altar. Staatliche Kunsthalle Karlsruhe, Spätmittelalter am Oberrhein, vol. 1, Maler und Werkstätten 1450–1525 (Stuttgart: Jan Thorbecke Verlag, 2001), 312, cat. 177b and 177c. 11. On the confluence of narrative and devotional qualities in the Wiener Schottenaltar, see Martin Czernin, Museum im Schottenstift: Kunstsammlung der Benediktinerabtei Unserer Lieben Frau zu den Schotten in Wien (Vienna: Museum im Schottenstift, 2009), 170, 172. 12. See James H. Marrow, Passion Iconography in Northern European Art of the Late Middle Ages and Early Renaissance: A Study of the Transformation of Sacred Metaphor into Descriptive Narrative (Kortrijk, Belgium: Van Ghemmert Publishing Company, 1979). 13. Isaiah 53:7; Marrow, Passion Iconography, 163–64. 14. Psalm 22:6; Marrow, Passion Iconography, 62–63. 16. There are precedents for using a depiction of Saint John’s written testimony to corroborate his eyewitness of the Passion. See Alfred Acres, “Rogier van der Weyden’s Painted Texts,” Artibus et Historiae 21 (2000): 97–101, https://doi.org/10.2307/1483636. 17. Isaiah 53:7; Marrow, Passion Iconography, 96–97. 18. Psalm 22:12-13; 59:6-7; 22:21; James Marrow, “Circumdederunt me canes multi: Christ’s Tormentors in Northern European Art of the Late Middle Ages and Renaissance,” Art Bulletin 59 (June 1977): 167–81, https://doi.org/10.2307/3049628. 19. Deuteronomy 21:4; Marrow, Passion Iconography, 99–104. 20. For example, see the relationship of the Holy Face to the Incarnation, representation, and imaged prayer in Walter Melion, “Pictorial Artifice and Catholic Devotion in Abraham Bloemaert’s Virgin of Sorrows with the Holy Face of c. 1615,” in The Holy Face and the Paradox of Representation: Papers from a Colloquium Held at the Bibliotheca Hertziana, Rome and the Villa Spelman, Florence, 1996, vol. 6, ed. Herbert L. Kessler and Gerhard Wolf (Bologna: Nuova Alfa Editoriale, 1998), 319–40. 21. 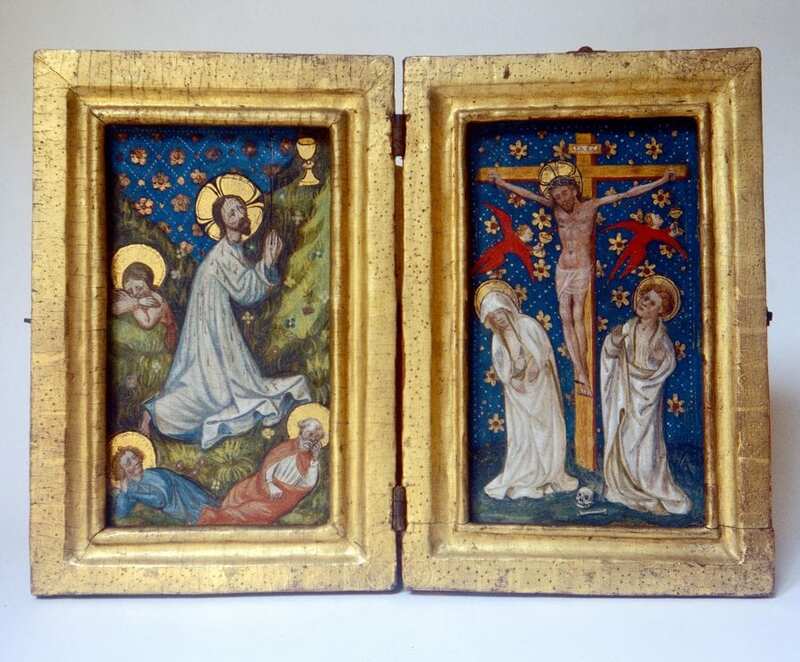 Although these two panels currently occupy the middle section of a triptych conserved in Aachen, technical and dendrochronological inconsistencies cast considerable doubt on the likelihood that they were created as an ensemble. John Oliver Hand, Catherine A. Metzger, and Ron Spronk, eds., Prayers and Portraits: Unfolding the Netherlandish Diptych (Washington, D.C.: National Gallery of Art, 2006), 40-41; Ron Spronk, “Three Boutsian Paintings in the Fogg Art Museum: Technical Examinations and Art Historical Implications,” in Bouts Studies: Proceedings of the International Colloquium, ed. B. Cardon, M. Smeyers, R. Van Schoute, and H. Verougstraete (Leuven: Uitgeverij Peeters, 2001), 448-49. 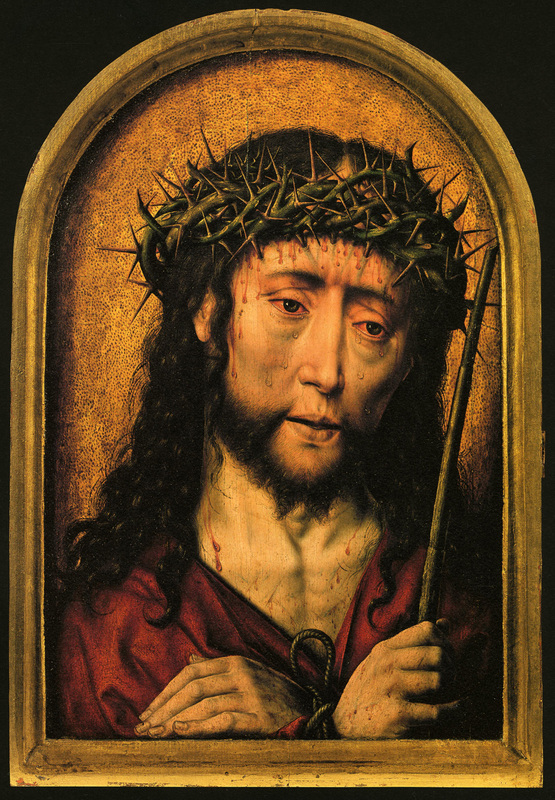 The Bouts workshop frequently produced solo representations of the Man of Sorrows, or in this case, the Ecce Homo. Buyers could then exercise their own initiative in selecting a particular Mater Dolorosa to accompany a Christological panel. Ibid., 449; Hand, Metger, and Spronk, Prayers and Portraits, 50-51. Although the Aachen assembly is not original, it approximates the kinds of pairings that were possible in the Renaissance. 22. On narrative and Andachtsbild in configurations of the Man of Sorrows and Ecce Homo, see Sixten Ringbom, Icon to Narrative, the Rise of the Dramatic Close-Up in Fifteenth-Century Devotional Painting, 2nd ed. (Doornspijk, The Netherlands: Davaco, 1984), esp. 52–58, 66–71, 117–47, 155–70. 23. For Ringbom’s discussion of northern Italian images of Christ carrying the cross, see ibid., 147–55. 24. I am indebted to Walter S. Melion for this analysis of the Schongauer print. 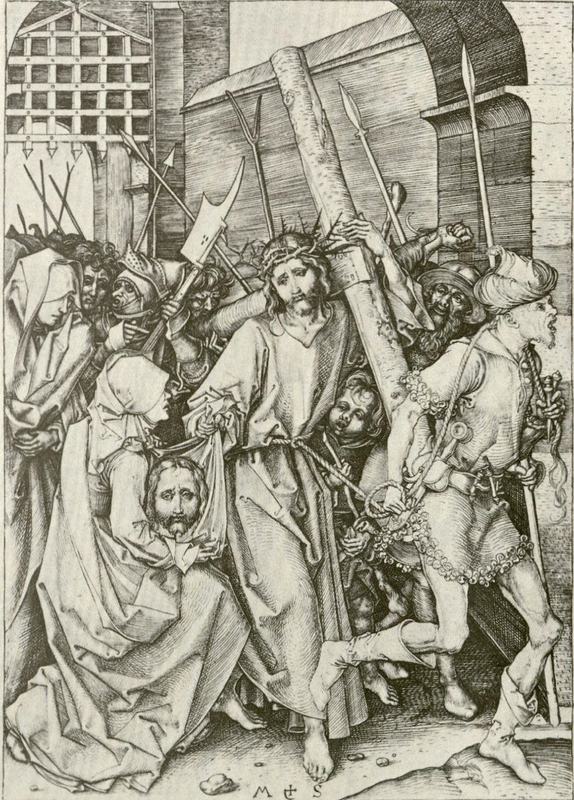 The iconography of the Atlanta Christ Carrying the Cross was compared to Schongauer’s print by Ilse Hecht in her letter from March 23, 1982, in the High Museum curatorial file. 25. On the devotional valence of print media, particularly in depictions of the Veronica image, see Hans Belting, Likeness and Presence: A History of the Image before the Era of Art, trans. Edmund Jephcott (Chicago: University of Chicago Press, 1994), 425–32; Kessler and Wolf, The Holy Face and the Paradox of Representation; David S. Areford, “Multiplying the Sacred: The Fifteenth-Century Woodcut as Reproduction, Surrogate, Simulation,” in The Woodcut in Fifteenth-Century Europe, ed. Peter Parshall, Studies in the History of Art 75 (Washington, D.C.: National Gallery of Art, 2009), 118–53; Jeffrey F. Hamburger, “‘In gebeden vnd in bilden geschriben’: Prints as Exemplars of Piety and the Culture of the Copy in Fifteenth-Century Germany,” in The Woodcut in Fifteenth-Century Europe, ed. Peter Parshall, Studies in the History of Art 75 (Washington, D.C.: National Gallery of Art, 2009), esp. 155–56. 26. Jörg Stocker and Martin Schaffner’s depiction of Christ carrying the cross from the Ennetacher Altar makes an insightful corollary to the Atlanta panel and the Schongauer print. Painted in 1496—only two years after the Atlanta-Chicago diptych—the work frames Christ’s face against the beams of his cross like an icon while Saint Veronica holds the sudarium for the viewer’s contemplation. See Manuel Teget-Welz, Martin Schaffner: Leben und Werk eines Ulmer Malers zwischen Spätmittelalter und Renaissance (Stuttgart: Kohlhammer, 2008), 54–66. 27. I am indebted to the High Museum’s docent manual, available in the curatorial file, for the observation that the soldiers have switched hats. 30. Chapter 76, in John of Caulibus, Meditations on the Life of Christ, trans. and ed. Francis X. Taney, Anne Miller, and C. Mary Stallings-Taney (Asheville, N.C.: Pegasus Press, 2000), 248. 33. See Don Denny, “A Symbol in Hugo van der Goes’ Lamentation,” Gazette des Beaux-Arts 95 (1980): 121–24; Hand, Metzger, and Spronk, Prayers and Portraits, 98. 34. Denny, “A Symbol in Hugo van der Goes’ Lamentation,” 121. 36. See C. G. Boerner, Auktions-Institut, Kunst- und Buchantiquariat, Deutsche Handzeichnungen aus der Sammlung weiland Prinz Johann Georg, Herzog zu Sachsen und aus anderem Besitz: Romantiker und Nazarener; alte Meister des 15.–18. Jahrhunderts, neuere Meister; Versteigerung am 24. und 25. April 1940 (Katalog Nr. 203) (Leipzig: C. G. Boerner, 1940), 5, cat. 36. 38. Chapter 78, in John of Caulibus, Meditations on the Life of Christ, 254. 39. Chapter 77, in ibid., 250. 40. See Mark Trowbridge, “Art and Ommegangen: Paintings, Processions, and Dramas in the Late-Medieval Low Countries” (PhD diss., Institute of Fine Arts, New York University, 2000); Mark Trowbridge, “Sin and Redemption in Late-Medieval Art and Theater: The Magdalen as Role Model in Hugo van der Goes’s Vienna Diptych,” in Push Me, Pull You: Imaginative and Emotional Interaction in Late Medieval and Renaissance Art, vol. 1, ed. Sarah Blick and Laura D. Gelfand (Leiden: Brill, 2011), 415–45; Mark Trowbridge, “Late-Medieval Art and Theatre: The Prophets in Hugo van der Goes’s Berlin Adoration of the Shepherds,” in New Studies on Old Masters: Essays in Renaissance Art in Honour of Colin Eisler, ed. Diane Wolfthal and John Garton (Toronto: Centre for Reformation and Renaissance Studies, 2011), 143–58. 41. Lines 1258–65, in The Saint Gall Passion Play, trans. and ed. Larry E. West, in Medieval Classics: Texts and Studies, vol. 6, ed. Joseph Szövérffy and Joseph F.-M. Marique (Brookline, Mass. : Classical Folia Editions, 1976), 106. 42. Sandro Sticca, The Planctus Mariae in the Dramatic Tradition of the Middle Ages, trans. Joseph R. Berrigan (Athens: University of Georgia Press, 1988), esp. 119–20; Peter Victor Loewen, “‘Singing Men into Spiritual Joy’: The Rhetoric of Franciscan Piety in the Songs of the Medieval German Passion Play and Marienklage” (PhD diss., University of Southern California, 2001), esp. 374. See also Christine Stridde, “Evangelische, visionäre oder gespielte Zeugenschaft? Passion im Rheinischen Marienlob,” in Zeugnis und Zeugenschaft: Perspectiven aus der Vormoderne, ed. Wolfram Drews and Heike Schlie (Munich: Wilhelm Fink, 2011), 197–219. 43. Lines 1374–80, in The Saint Gall Passion Play, ed. West, 111. 44. Lines 1384–1400, in ibid., 111–12. For this pattern of conforming to Christ in the Marienklagen by identifying first with Mary’s maternal sorrow and then with her imitative grief, see Loewen, “‘Singing Men into Spiritual Joy’,” 449–51. For a related study on Marian sermons, see Donna Spivey Ellington, “Impassioned Mother or Passive Icon: The Virgin’s Role in Late Medieval and Early Modern Passion Sermons,” Renaissance Quarterly 48 (Summer 1995): 227–61, esp., 231–32, https://doi.org/10.2307/2863065. 45. Lines 322–24, in Texte und Melodien der “Erlauer Spiele,” ed. Wolfgang Suppan and Johannes Janota, Musikethnologische Sammelbände 11 (Tutzing: Hans Schneider, 1990), 205; translated in Loewen, “‘Singing Men into Spiritual Joy’,” 448. 46. Loewen, “‘Singing Men into Spiritual Joy’”; Peter Loewen, “Portrayals of the Vita Christi in the Medieval German Marienklage: Signs of Franciscan Exegesis and Rhetoric in Drama and Music,” Comparative Drama 42 (Fall 2008): 315–45, https://doi.org/10.1353/cdr.0.0017. 47. Lines 2041–42, in the Sterzinger Passionsspiel (1496), quoted in N. H. J. Zwijnenburg, Die Veronicagestalt in den Deutschen Passionsspielen des 15. und 16. Jahrhunderts, Amsterdamer Publikationen zur Sprache und Literatur 79, ed. Cola Minis and Arend Quak (Amsterdam: Rodopi, 1988), 67. I am grateful to Albrecht Classen for the translation of this passage. For the sudarium as a consolation for the sorrowful heart, see lines 1602–11, in the Augsburger Passionsspiel (last quarter of the fifteenth century), quoted in Zwijnenburg, Die Veronicagestalt, 77–78. For the sudarium as a sign, see lines 5438–95, in the Alsfelder Passionsspiel (early sixteenth century), quoted in Zwijnenburg, Die Veronicagestalt, 56–59. 48. On representations of visionary sight, see Bret Rothstein, Sight and Spirituality in Early Netherlandish Painting (Cambridge: Cambridge University Press, 2005), chapter 2, esp. 50-52. 49. See Hand, Metger, and Spronk, Prayers and Portraits, 210-17. 50. 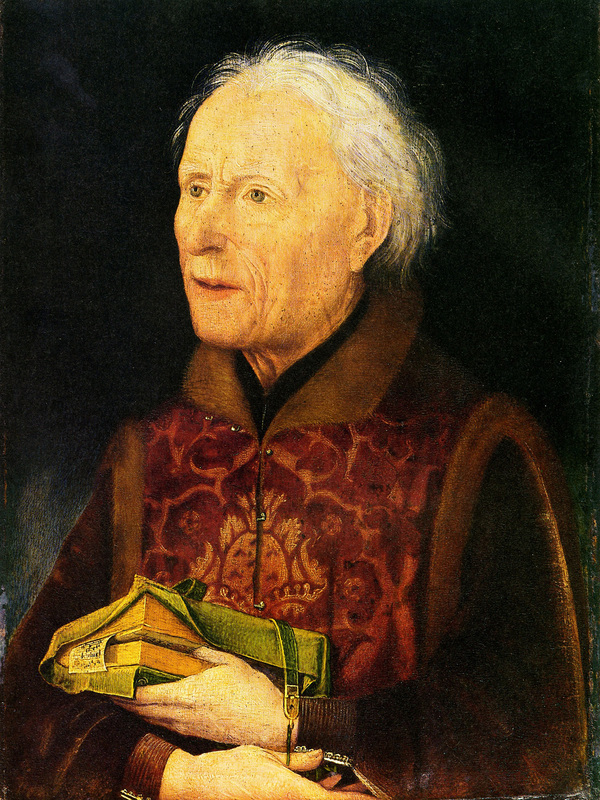 Annette Scherer, “Fromme Rätsel: Beobachtungen zum Diptychon eines Franziskaners von Jan Provost,” in Im Zeichen des Christkinds: Privates Bild und Frömmigkeit im Spätmittelalter; Ergebnisse der Ausstellung Spiegel der Seligkeit, ed. Frank Matthias Kammel (Nuremberg: Verlag des Germanischen Nationalmuseums, 2003), 79. 51. Metropolitan Museum of Art, Gothic and Renaissance Art in Nuremberg 1300–1500 (New York: Metropolitan Museum of Art, 1986), 170, cat. 41. 53. See Voll, Braune, and Buchheit, Katalog der Gemälde, 243, cat. 871a and 871b. 59. I am indebted to Walter S. Melion for noting the implications of red blood on the intensely white veil. 60. On blood- and tear-stained cloth in Germanic painting, see David S. Areford, The Art of Empathy: The Mother of Sorrows in Northern Renaissance Art and Devotion (Jacksonville, Fla.: Cummer Museum of Art and Gardens, 2013), 18, 31, 43, 46. Areford also cites the miracle-working panel of the Mater Dolorosa from the Church of Santa Maria in Ara Coeli, in which the Virgin’s violet mantle is stained with blood. Ibid., 38, 40. 62. John 12:3, Luke 7:38. 63. J. R. Hale argues that the motif of a face on a shield appears most frequently in Bohemian Crucifixion scenes of the late fourteenth and early fifteenth centuries. He interprets it as an apotropaic device underscoring the idolatry of the centurion who later confessed Christ’s divinity. J.R. Hale, “Soldiers in the Religious Art of the Renaissance,” Bulletin of the John Rylands University Library of Manchester 69 (Autumn 1986): 176n16, https://doi.org/10.7227/BJRL.69.1.7. I am grateful to my student, Timothy Elliott, for his assistance in researching this armorial device. 64. Much of this analysis could also be applied to the shield depicted in the Munich Crucifixion cited earlier (fig. 7). The grotesque head in that composition is bearded, with thornlike horns above its eyes and locks of hair near the hand of the soldier. The expression of angst on its face, coupled with these other features, makes a pointed comparison to the sudarium. 65. See Jamie L. Smith, “‘So moeti den schilt draghen; Dien God veruwede met roder greine’: Jan van Eyck’s Critical Principles of Oil Painting and Their Middle Dutch Antecedents” (PhD diss., The Johns Hopkins University, 2008), chapter 2, esp. 39–47. 67. It is interesting to recall that, according to legend, the centurion Saint Longinus was healed of spiritual and physical blindness when his eyes came into contact with blood from Christ’s side wound. Areford, David S. “Multiplying the Sacred: The Fifteenth-Century Woodcut as Reproduction, Surrogate, Simulation.” In The Woodcut in Fifteenth-Century Europe, edited by Peter Parshall, 118–53. Studies in the History of Art 75. Washington, D.C.: National Gallery of Art, 2009. ——. The Art of Empathy: The Mother of Sorrows in Northern Renaissance Art and Devotion. Jacksonville, Fla.: Cummer Museum of Art and Gardens, 2013. Baldass, Ludwig. Österreichische Tafelmalerei der Spätgotik 1400–1525. Vienna: Kunsthistorisches Museum, 1934. Becks, Jürgen and Martin Wilhelm Roelen, eds. Derick Baegert und sein Werk. Wesel: Stadt Wesel, 2011. Belting, Hans. Likeness and Presence: A History of the Image before the Era of Art. Translated by Edmund Jephcott. Chicago: University of Chicago Press, 1994. Brettell, Richard R., and Steven Starling. The Art of the Edge: European Frames 1300–1900. Chicago: Art Institute of Chicago, 1986. C. G. Boerner, Auktions-Institut, Kunst- und Buchantiquariat. Deutsche Handzeichnungen aus der Sammlung weiland Prinz Johann Georg, Herzog zu Sachsen und aus anderem Besitz: Romantiker und Nazarener; alte Meister des 15.–18. Jahrhunderts, neuere Meister; Versteigerung am 24. und 25. April 1940 (Katalog Nr. 203). Leipzig: C. G. Boerner, 1940. Czernin, Martin. Museum im Schottenstift: Kunstsammlung der Benediktinerabtei Unserer Lieben Frau zu den Schotten in Wien. Vienna: Museum im Schottenstift, 2009. Denny, Don. 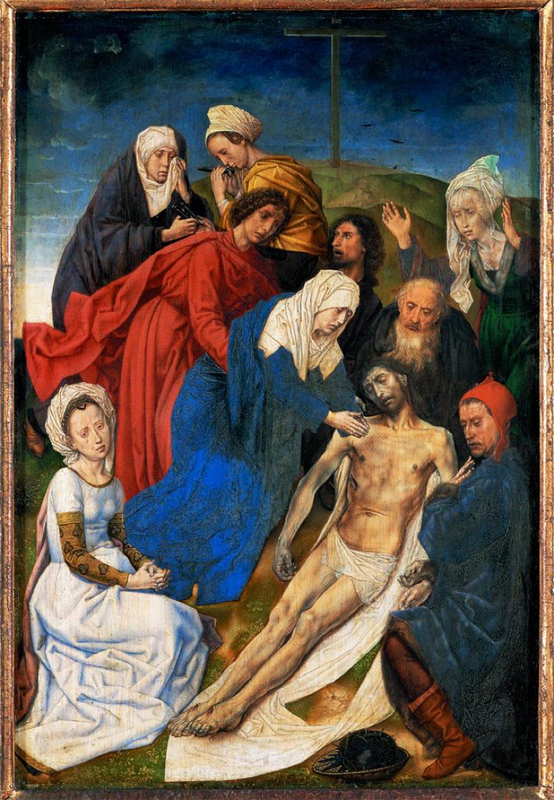 “A Symbol in Hugo van der Goes’ Lamentation.” Gazette des Beaux-Arts 95 (1980): 121–24. Hamburger, Jeffrey F.“‘In gebeden vnd in bilden geschriben’: Prints as Exemplars of Piety and the Culture of the Copy in Fifteenth-Century Germany.” In The Woodcut in Fifteenth-Century Europe, edited by Peter Parshall, 154–89. Studies in the History of Art 75. Washington, D.C.: National Gallery of Art, 2009. Hand, John Oliver, Catherine A. Metzger, and Ron Spronk, eds. 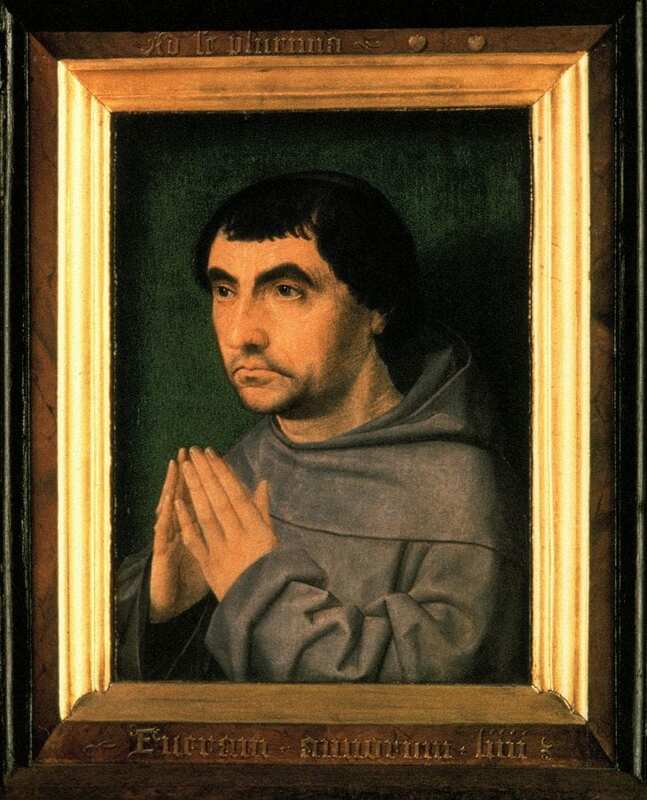 Prayers and Portraits: Unfolding the Netherlandish Diptych. Washington, D.C.: National Gallery of Art, 2006. John of Caulibus. Meditations on the Life of Christ. Translated and edited by Francis X. Taney, Anne Miller, and C. Mary Stallings-Taney. Asheville, N.C.: Pegasus Press, 2000. Kessler, Herbert L., and Gerhard Wolf, eds. The Holy Face and the Paradox of Representation: Papers from a Colloquium Held at the Bibliotheca Hertziana, Rome and the Villa Spelman, Florence, 1996. Vol. 6. Bologna: Nuova Alfa Editoriale, 1998. Kuhn, Charles L. A Catalogue of German Paintings of the Middle Ages and Renaissance in American Collections. Cambridge, Mass. : Harvard University Press, 1936. Loewen, Peter Victor. “‘Singing Men into Spiritual Joy’: The Rhetoric of Franciscan Piety in the Songs of the Medieval German Passion Play and Marienklage.” PhD diss., University of Southern California, 2001. ——. Passion Iconography in Northern European Art of the Late Middle Ages and Early Renaissance: A Study of the Transformation of Sacred Metaphor into Descriptive Narrative. Kortrijk, Belgium: Van Ghemmert Publishing Company, 1979. Melion, Walter. “Pictorial Artifice and Catholic Devotion in Abraham Bloemaert’s Virgin of Sorrows with the Holy Face of c. 1615.” In The Holy Face and the Paradox of Representation: Papers from a Colloquium Held at the Bibliotheca Hertziana, Rome and the Villa Spelman, Florence, 1996, vol. 6, edited by Herbert L. Kessler and Gerhard Wolf, 319–40. Bologna: Nuova Alfa Editoriale, 1998. Metropolitan Museum of Art. 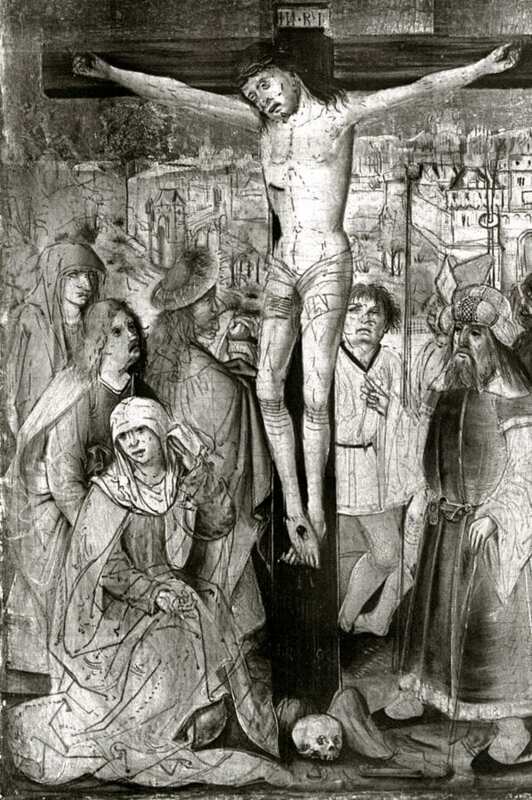 Gothic and Renaissance Art in Nuremberg 1300–1500. New York: Metropolitan Museum of Art, 1986. Rich, Daniel Catton, ed., Catalogue of the Charles H. and Mary F. S. Worcester Collection of Paintings, Sculpture and Drawings. Chicago: Art Institute of Chicago, 1938. Ringbom, Sixten. Icon to Narrative, the Rise of the Dramatic Close-Up in Fifteenth-Century Devotional Painting. 2nd ed. Doornspijk, The Netherlands: Davaco, 1984. Rothstein, Bret. Sight and Spirituality in Early Netherlandish Painting. Cambridge: Cambridge University Press, 2005. Salzburger Museum Carolino Augusteum. Spätgotik in Salzburg: Die Malerei 1400–1530. Salzburg: Salzburger Museum Carolino Augusteum, 1972. Scherer, Annette. “Fromme Rätsel: Beobachtungen zum Diptychon eines Franziskaners von Jan Provost.” In Im Zeichen des Christkinds: Privates Bild und Frömmigkeit im Spätmittelalter: Ergebnisse der Ausstellung Spiegel der Seligkeit, edited by Frank Matthias Kammel, 78–86. Nuremberg: Verlag des Germanischen Nationalmuseums, 2003. Smith, Jamie L. “‘So moeti den schilt draghen; Dien God veruwede met roder greine’: Jan van Eyck’s Critical Principles of Oil Painting and Their Middle Dutch Antecedents.” PhD diss., The Johns Hopkins University, 2008. Spronk, Ron. “Three Boutsian Paintings in the Fogg Art Museum: Technical Examinations and Art Historical Implications.” In Bouts Studies: Proceedings of the International Colloquium, edited by B. Cardon, M. Smeyers, R. Van Schoute, and H. Verougstraete, 423–49. Leuven: Uitgeverij Peeters, 2001. Staatliche Kunsthalle Karlsruhe. Spätmittelalter am Oberrhein. Vol. 1, Maler und Werkstätten 1450–1525. Stuttgart: Jan Thorbecke Verlag, 2001. Stange, Alfred. Deutsche Malerei der Gotik. Vol 10, Salzburg, Bayern, und Tirol in der Zeit von 1400 bis 1500. Munich: Deutscher Kunstverlag, 1960. Sticca, Sandro. The Planctus Mariae in the Dramatic Tradition of the Middle Ages. Translated by Joseph R. Berrigan. Athens: The University of Georgia Press, 1988. Stridde, Christine. “Evangelische, visionäre oder gespielte Zeugenschaft? Passion im Rheinischen Marienlob.” In Zeugnis und Zeugenschaft: Perspectiven aus der Vormoderne, edited by Wolfram Drews and Heike Schlie, 197–219. Munich: Wilhelm Fink, 2011. Suppan, Wolfgang, and Johannes Janota, eds. Texte und Melodien der “Erlauer Spiele.” Musikethnologische Sammelbände 11. Tutzing: Hans Schneider, 1990. Teget-Welz, Manuel. Martin Schaffner: Leben und Werk eines Ulmer Malers zwischen Spätmittelalter und Renaissance. Stuttgart: Kohlhammer, 2008. Trowbridge, Mark. “Art and Ommegangen: Paintings, Processions, and Dramas in the Late-Medieval Low Countries.” PhD diss., Institute of Fine Arts, New York University, 2000. ——. Late-Medieval Art and Theatre: The Prophets in Hugo van der Goes’s Berlin Adoration of the Shepherds.” In New Studies on Old Masters: Essays in Renaissance Art in Honour of Colin Eisler, edited by Diane Wolfthal and John Garton, 143–58. Toronto: Centre for Reformation and Renaissance Studies, 2011. Voll, Karl, Heinz Braune, and Hans Buchheit. Katalog der Gemälde des Bayerischen Nationalmuseums. Munich: Bayerisches Nationalmuseum, 1908. West, Larry E., trans. and ed. The Saint Gall Passion Play. In Medieval Classics: Texts and Studies, vol. 6, edited by Joseph Szövérffy and Joseph F.-M. Marique. Brookline, Mass. : Classical Folia Editions, 1976. Wolff, Martha, Susan Frances Jones, Richard G. Mann, and Judith Berg Sobré, eds. Northern European and Spanish Paintings before 1600 in the Art Institute of Chicago: A Catalogue of the Collection. New Haven: Yale University Press, 2008. Zwijnenburg, N. H. J. Die Veronicagestalt in den Deutschen Passionsspielen des 15. und 16. Jahrhunderts. Amsterdamer Publikationen zur Sprache und Literatur 79, edited by Cola Minis and Arend Quak. Amsterdam: Rodopi, 1988.